Not that we needed an excuse, but still...it is New Year's Day!!! We are ringing in the NEW YEAR with some essentials…. Two NEW SONGS (and a rehearsal tomorrow to bring them to life). And, more importantly, NEW SHOES. We think 2012 will be a very fun year!! 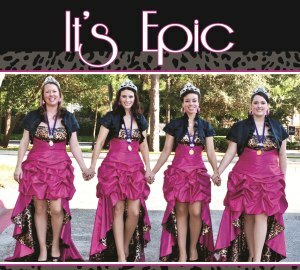 The entire Epic family wishes you a fantastic start to the year. We hope the year brings you good health, good fortune and a harmonious blend of friendship and memorable experiences. Now seriously, you should consider buying some fabulous shoes. It really is a great way to celebrate.